← A different way to set your quilt blocks "On-Point"
Have you ever dreamed of a career in the quilting industry? Who amongst us hasn’t? But few of us know how to go about getting started. Well, Merry May and Linda J. Hahn have tapped their 40 years of experience in the quilting industry to create this new, 165 page, publication. So what would you like to know about? Being a Shop Owner? It’s here, including costs, income potential, advertising, necessary equipment, and on and on. How about being a Teacher? That’s here too. How to get organized, supply lists, handouts, marketing yourself, ethics, and what to do and NOT to do. How about having a career as a Long Arm Machine Quilter, or a Designer, or a Judge? It’s all here. 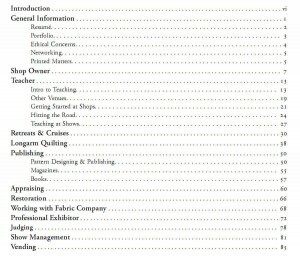 In fact, we’ll just stick the table of contents below so you can see for yourself what all is included. Nothing’s been left out. As an added bonus, there is a section with nothing but forms, forms, forms. Yes, pesky paperwork is part of any successful venture. But this book makes it easy, giving you a starting point from which to work. Appraisal worksheets, Longarm Work Order, Business Plan, Instructor Contract, Teaching Contract, more contracts and contracts and contracts. Merry and Linda have thought of everything. So when the boss isn’t looking, hop over to our sister website, QuiltWoman.com, and see what this book is all about. If you are tired of having Walter Mitty type daydreams, maybe it’s time to start that new career in the quilting world. This book can be the start of a new career! This entry was posted in Publications and tagged Careers. Bookmark the permalink.